apple almond phyllo tart. brown butter chocolate custard cupcakes. garlic roasted acorn squash. autumn granola. chai tea sugar cookies. organic apple rings. chocolate peanut butter. butterfinger fudge. honey spiced almond milk. turkey thai crunch salad. two bite apple cinnamon oatmeal cookies. pear and almond cream pie. simple roasted brussels sprouts. apple pie with crumb topping. gluten free salted chocolate chip cookies. sweet potato, zucchini + crimini mushroom gratin. easy caramel apple pie. dulce de leche cake. gluten free chocolate chip peanut butter cookies. cinnamon apple galette with vanilla sugar. sweet potato pie. brown butter salted chocolate chip cookies. salted chocolate pecan pie. roasted butternut squash "fries"
My favorite season is upon us- FALL! Hooray for fall guys! Here come all the warm and inviting smells and foods, amiright? 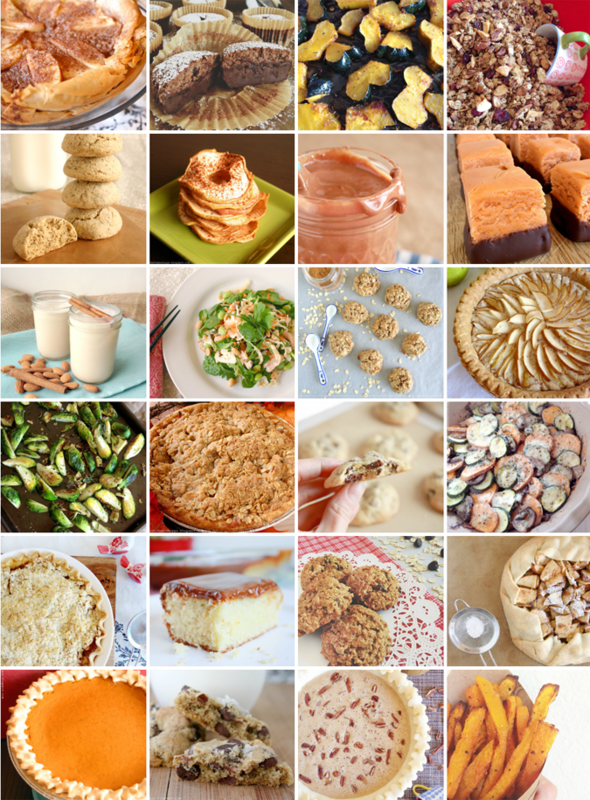 Here's 24 fall inspired recipes to get your baking and cooking senses tingling! What are you wanting to try? I love sweet potatoes, but have never tried sweet potato pie. Trying your recipe may need to happen soon. All of these look so good! Oh wow, I need to make all of these. Fall baking is the best! So agree! Fall baking IS the best! Oh you totally have to try it! It's great! If you like pumpkin pie, you'll love it.